I called Gerber after seeing the #7 on the bottom of their containers. #7 usually indicates BPA (bisphenol-A), the harmful substance found in polycarbonate plastics. Look at the bottom of all plastic containers. If the recycle symbol contains a #7, avoid it. Most hard plastics are made from polycarbonate. #7 could also mean the plastic is a combination of 2 other types of plastics. This is the case with Gerber’s baby food containers. Gerber’s containers do not contain BPA, but that does not mean they are safe. It does say #7 on the bottom, but it is a mix of #1 and #6. #6 is styrofoam, which you still want to avoid. Please see this handout for a guide to safer plastic usage for your family. The concern for plastic chemicals leaching into foods is heightened when the plastic is heated — regardless of the plastic type. Jarred or canned food is typically heated during the canning process. So, the risk is already there before its on the store shelves. If you heat leftover baby food in this container, you are again increasing the risk for leaching. I would recommend avoiding these Gerber plastic containers. For baby food, I highly recommend Earth’s Best. It’s organic so you are limiting your baby’s exposure to harmful pesticides and the food comes in a glass jar – the safest type of storage container as it does not leach. Del Monte’s Nature’s Goodness and Beech Nut baby foods also come in glass jars. You can also make your own baby food using organic products. I have used very little Gerber baby food and now I am so glad I did and will avoid it like the plague for future children. I recently spoke with the analyst from the Environmental Working Group who did the research for their recent report on BPA in baby formula and during our conversation, I asked her about the Gerber baby food packs with the #7 containers. 3 and 6 plastics almost always contain BPA. Plastics marked with a 7 indicates that the plastic is made with 2 or more types of plastic (so for example a plastic container marked with a 7 could be made of 1 and 2 plastics combined.) 7 is a “catch all” number so they advise people to avoid it IF they don’t know what plastics are in it. According to EWG, she contacted Gerber and they said the 7 plastics used in baby food containers are made with both #1 and #2 plastics so there is no BPA in them. I am not 100% sure of the containers Gerber uses for their little meals like raviolis and stuff. This of course is what the EWG has told me and not heard directly from the company. I might have to call them myself to confirm this information though. A note about baby food in glass jars too… apparently many times BPA is used in the plastic coating on the LID of glass baby food jars. When I heard that I about fainted. It feels like there is no escape! Thanks for your comments. Good point that the plastic could be a mix of other plastics. I was not aware of this. Gerber’s containers do NOT contain BPA however, they do contain polystyrene, more commonly known as styrofoam and also a plastic that should be avoided. Gerber said their baby food line containers are made from a combination of polystyrene (#6, styrofoam) and polyethylene (#1, considered a safer plastic). Their Gerber Graduate line is polypropylene lining (#5, considered a safer plastic) and the label is polystyrene (#6, styrofoam). Also good information about the metal lid, but at least very little food touches it and you can limit the exposure by not scraping the food out of the lid and feeding it to your baby. You may want to double check on the Earth’s Best. When I called, I was told they do contain bpa in the lids of their food jars. However, Beechnut and Healthy Times (organic) do not use bpa in their lids. Hi just saw this post. There were some reports on bpa in some Beechnut stuff recently, 4 years on. Gerber really doesn’t care. Their #7 plastic containers have a nasty plastic smell when you first open them…. I wonder what this does to the food??? Well then F–K YOU GERBER, EAT IT! 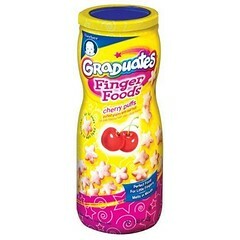 If your wondering which containers have the nasty plastic smell, test out the Graduate Finger Foods such as the Cherry or Banana puffs, etc. …The smell is most strong right after opening (when it has been closed for a while). The plastic fumes are leaching out!!!!!! Do NOT trust GERBER or anyone that uses plastic for food storage! ….USE GLASS, or make your own baby food. PERIOD! Why does Gerber allow AZO compounds in the polymers that make up the baby food jars. Possibly they don’t even know this. A large number of molecules of this and other chemical will leach into the baby food. Much, much more than a million in each jar. Have these polymers been FDA approved. Don’t think so. Companies like Keller and Heckman send out approval letters for products. I don’t believe approval letters like this are not worth the paper they are printed on. A great company like Gerber needs to do a better job in finding out what is in the plastics they use. This includes all reaction byproducts. Bottom line. Mothers. DO NOT feed your baby out of plastic baby food jars. I love gerber’s Best products. That’s the only product I use for my baby! My baby loves it and I never had any problem with it. It organic which makes it all that much better!